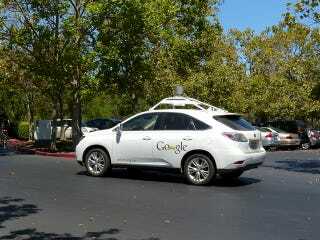 Here Is Your Self-Driving Car! But Do You Want It? So long, jetpacks! Our self-driving car has arrived. Burkhard Bilger has a rundown of the fascinating build-up to the self-driving car and its future in the New Yorker — and in this case the future is now. Now, the question is, are we really ready to start using it? It&apos;s not every day you have to give way to a car that lacks a human driver. Of course, the computer has always had a human driver to take over in tight spots. Left to its own devices, Thrun says, it could go only about fifty thousand miles on freeways without a major mistake. Google calls this the dog-food stage: not quite fit for human consumption. "The risk is too high," Thrun says. "You would never accept it." The car has trouble in the rain, for instance, when its lasers bounce off shiny surfaces. (The first drops call forth a small icon of a cloud onscreen and a voice warning that auto-drive will soon disengage.) It can't tell wet concrete from dry or fresh asphalt from firm. It can't hear a traffic cop's whistle or follow hand signals. And yet, for each of its failings, the car has a corresponding strength. It never gets drowsy or distracted, never wonders who has the right-of-way. It knows every turn, tree, and streetlight ahead in precise, three-dimensional detail. Dolgov was riding through a wooded area one night when the car suddenly slowed to a crawl. "I was thinking, What the hell? It must be a bug," he told me. "Then we noticed the deer walking along the shoulder." The car, unlike its riders, could see in the dark. Within a year, Thrun added, it should be safe for a hundred thousand miles. So what do you folks think? Are you ready to welcome our new robotic traffic overlords with open arms (and just wait out any light drizzles in the parking lot) or are you keeping both hands firmly (at ten and two) on the wheel?